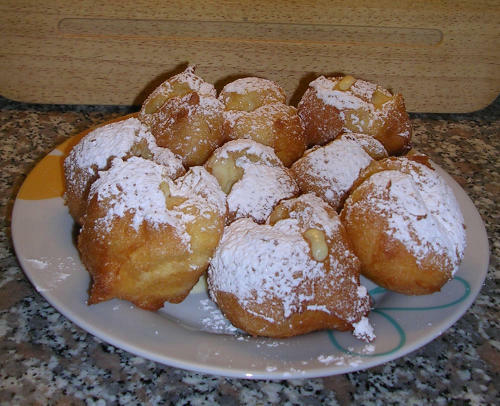 The History of the Frittella: Carnival – never before in this period, the proverb “Semel in anno Licet insane” seems to fit the reality of a city in celebration, not only with its masks, but also the sweet treats that are the delight of gourmets and also of those who would tend to avoid calories in excess. 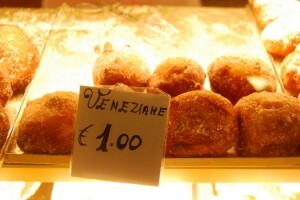 It is impossible to resist to the sweet temptations in the form offrittelle, be it authentic Venetian ones, with cream or zabaglione cream , or galani (fried sweet thin crackers) baked or fried in oil and sprinkled with an intangible, but dazzling sugar icing, perhaps slightly scented with vanilla. But, as with any self-respecting party, during the Venice Carnival, the Queen of cakes is the FRITTELLA. 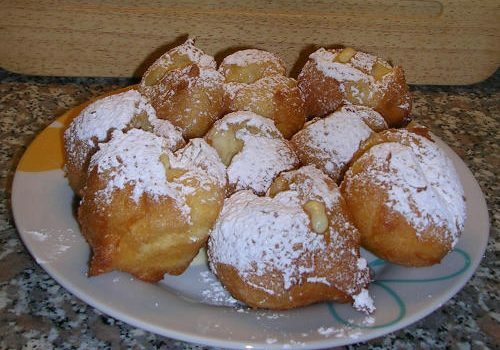 The old recipe is given by Bartolemeo Scappi, chef of Pius V.
In Venice, the “fritole” was considered the national dessert since the days of the Serenissima Republic and you could taste it not only in Venice, but throughout the Veneto and the region of Friuli, up to almost the outskirts of Milan. 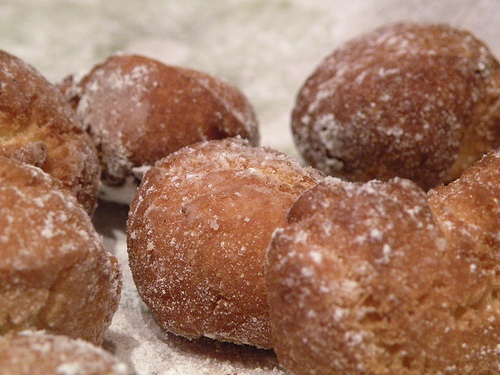 The undisputed queen of Venetian sweets, the frittella or fritoa lends itself to live with the carnival its magic moment. The fritole, which held the sceptre of the art of confectionery of the people, was produced in various streets of the city, as well as in homes and bakeries , but mostly in wooden huts of a square shape. 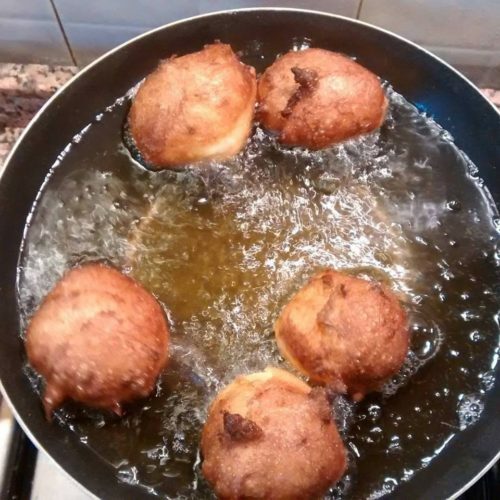 The producers of the fritole were the fritoleri, who were both producers and sellers of this fritters. The fritoleri, as if to emphasize their exclusivity to produce them, in the ‘600 formed an association, composed of seventy fritoleri, each with its own area where he could exercise the exclusive business and,pass it on exclusively to his children. The corporation remained active until the fall of the Republic, though the art of “fritoleri” definitively disappeared from the streets of Venice only in the late nineteenth century. They always have a diaper in the front apron which resembles a woman’s apron, who appears to have just come out from the laundry. They hold in their hands a jar with holes with which they throw sugar on the goods, but with this attitude that seems to mean: and who can smell and taste what we are sugaring? “. This is the way the Venetian nobleman and noted economist Pietro Gasparo Moro Lin painted these particular artisans of the kitchen, while historic Venetian Giovanni Marangoni wrote: “cookers and sellers at a time, kneading the flour on a large table and then frying them with oil, lard or butter, supported by large pans on tripods. Once cooked the cakes were displayed on various and richly decorated plates, of tin or pewter. On other plates, demonstrating the goodness of the product, the ingredients used were exposed: pine nuts , raisins, mixed dried peel. Even if the only real frittella remains the Venetian one, all over Veneto local recipes spread, and we find those dipped in batter made with fruit or flowers or vegetables, even in some cases with weeds and grass of the mountain, and even with rice and polenta. But the influence of “fritoe” spread to other cultures too, so that there is even a Jewish frittola which the Venetian Jews still prepare for the Feast of Purim. In Venice during the Carnival celebrations it can be found everywhere, in each pastry shops and each bakeries. To taste these typical Venetian cake is a must for Carnival, perhaps if you accompany it with a good hot coffee or hot chocolate to warm up the cold nights of February or with a fresh, sparkling prosecco, a Venetian wine ideal as an aperitif or with dessert. Right now the city pursues the perfumes of it, the party is in the air and all the shops are not exempt from this collective ritual, a bit of an insult to the approaching Lent. 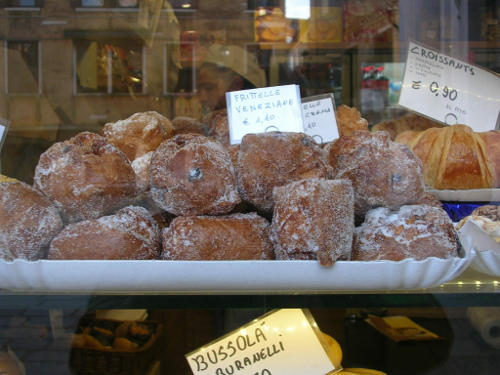 In each Venetian pastry shop, wherever in the city you are, trays full of frittelle wink at you from the window displays and even an ascetic would not be able to pass by without succumbing to the temptation of gluttony. quanto ca**o manca alla fine di Carnevale??? how long is it to the end of the carnival ??? Sublime frittelle with cream or the original Venetian, with zabaglione or with apples, in short, the list of choice which bakeries and pasticcerie offer in Venice would be way too long! The challenge may be to find the worst frittella, that one most full of grease, the most insipid or worst cooked. This would be much simpler, since there are no bad frittelle in Venice! So, if you are in Venice for Carnival, give yourself a challenge and find the best Frittella in Venice! Ps: spot how many different names I have used to indicate the fritters, it is not a mistake, but all the different ways it can be called!